The Samsung Galaxy Note III seems to pose for every camera it sees – yet another photo of the upcoming flagship phablet hit the web and it shows off the Galaxy S4-like design. Unfortunately, the Note III was wearing a cover, we have yet to see the back of the device (there should be a 13MP camera on there). At least the new photo shows the side of the device, which unsurprisingly sports a silver strip with the Power/Lock key. By all accounts, the screen of the Galaxy Note III should be a 6" Super AMOLED with 1080p resolution. 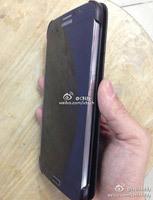 The phablet is expected to use the same Snapdragon 800 chipset that the Samsung Galaxy S4 SHV-E330S will use. I suppose the top bezel is going to be way smaller on the real Note 3. Yawn. Seems like I am not buying this as nothing spectacular like S3 to s4.